Back in May I showcased a 1953 Hamilton Illinois Signamatic. When I did that post, I realized there are actually three different Signamatic watches. The Signamatic from 1953 appears to be the same as the Signamatic A from 1954. 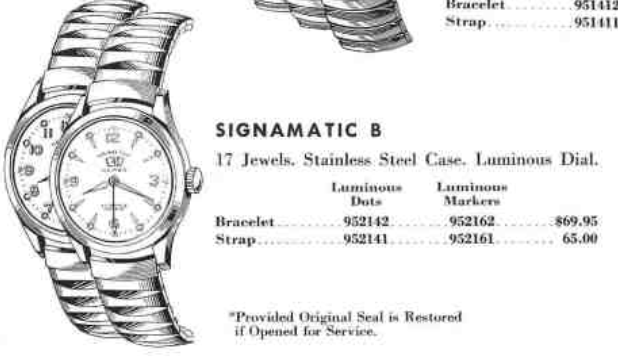 In 1954 there was also a Signamatic B - and it came with two different dial options. The Signamatic B comes in a stainless steel case, like the A model, but the lugs are a different shape and flat on the tops. Tucked inside both models is an Illinois-branded movement that is based on an ETA 1256. The ETA 1256 is also the basis for the Hamilton 672 that would be used later in the 1950's. What makes the Signamatic models interesting is the wind indicator to say how many hours of mainspring tension remains. It tops out at 40 and will work it's way to 0 as the watch runs - assuming you're not wearing it, since it winds while you move. I had some issues with my original Signamatic. Although it ran well, the wind indicator would sometimes not move and it would stop the watch by preventing the mainspring barrel from turning. I got to be very adept at taking it apart and putting it back together as I must have done it two dozen times. (Sometimes I hate this hobby). Like most collectors, I'm a glutton for punishment so I picked up a non-running Signamatic B to use for parts. As received it was in pretty good shape, but dirty and hadn't been cleaned in a long time. In the photo below I cleaned it up a bit. One thing I thought was interesting about the Signamatic B is the hands are golden colored, as are the numerals on the embossed dial. It took every ounce of strength I had in my hands to get the stainless steel back to screw off. The ETA 1256 inside was very straightforward to overhaul - after all the practice I had on the other one. I noticed on this movement one of the wheels used for the wind indicator was missing a tooth - that will cause the wind indicator dial to skip a little when that tooth comes into play. I swapped some of the parts with my other Signamatic and so far it's issues seem to be addressed. Phew! Time will tell though. (pardon the pun). I was able to get the Signamatic B to run too, so now both watches appear to be in working order. The Signamatic B is actually a nice looking watch, I think. I like the gold-tone numerals and hands with the stainless case. It's an odd combination but it pairs well with the vintage Gemex strap I installed on it. Hopefully the wind indicator will function as it should and not bind like the other watch was doing. Otherwise I may just disengage the complication so that it functions like any other automatic watch, just the wind indicator won't move... we'll see.